MBC Best Theatre's 6-month hiatus wil end on Oct 29 with the airing of 태능선수촌, which will be 4 episodes, set at 70min/ep, to air each Sat (previous news had this Best Theatre to be 5 epi at 70min/ep). More on Lee Min-ki's yudo/sumo character: an athlete that is really talented yet feels horror/fearful when attending competitions. Supposedly each ep will focus on one of the 4 athletes (?). 이민기 '무지개 빛' 미래 열렸어! 똘똘한 청년’ 이민기가 스타덤으로 가는 특급열차 ‘논스톱’호의 티켓을 손에 넣었다. MBC 인기 일일극 ‘굳세어라 금순아’에서 금순이(한혜진)의 철부지 시동생이자 귀여운 악동으로 시청자들한테 눈도장을 단단히 찍은 그가 이달 마지막주 주인공 자리에 이름 석자를 새긴 신작 두편을 들고 야심차게 ‘쌍포’를 터뜨린다. 청춘시트콤 ‘논스톱5’ 후속으로 24일부터 방송을 타는 ‘레인보우 로망스’에서 경호학과 2학년생 ‘이민기’로 시트콤 데뷔전을 치르는 데 이어 29일부터 4주동안 방송되는 MBC 베스트극장 ‘태릉선수촌’에서는 유도선수 ‘홍민기’로 연작드라마의 첫 주인공 신고식도 경험한다. 공교롭게도 비슷한 시기에 본명과 같은 두 명의 민기로 시청자와 만나게 됐다. 이 가운데 특히 ‘레인보우 로망스’는 그동안 조인성 현빈 한예슬 장나라 등 숱한 청춘스타를 배출한 논스톱 시리즈의 명맥을 잇는 새 청춘시트콤이다. 극중 이민기는 아버지의 사업 실패로 어린시절 가세가 급격히 기운 아픈 경험이 있으며, 사랑을 거부한 채 대통령의 경호실장이라는 꿈을 향해서만 달려간다. 제작진은 순수, 카리스마, 남자다움 등을 두루 갖춘 매력만점의 인물이라고 이민기의 배역을 설명하고 있다. ‘논스톱’ 스타사단의 명맥을 잇는 적자로 이민기를 ‘찜’해 놓은 것이다. 이민기가 6개월만에 부활하는 베스트극장의 첫 주인공이라는 점도 허투루 볼 일은 아니다. ‘태릉선수촌’에서 만화 ‘슬램덩크’의 강백호처럼 호기로움과 엉뚱함이 넘치는 유도선수 홍민기로 양궁 금메달리스트 방수아 역의 최정윤과 로맨스를 엮어가는 그는 또래 유망주와는 공통분모가 없는 이민기만의 특별한 무엇을 알릴 참이다. 여기저기서 왜 난데없이 이민기를 찾는가라는 질문도 나올 법하다. 게다가 눈과 입이 많이 큰 이민기는 한 눈에 부드럽게 시선을 파고드는 ‘꽃미남’형 미남도 아니다. 그러나 SBS 버라이어티프로그램 ‘X맨’에 출연했을 당시 ‘당연하지’게임에서 날카로운 재치를 뽐내 당초 예정됐던 출연기간 보다 1개월 이상 더 프로그램을 누빈 전례에서도 엿볼 수 있듯 이민기는 범상치않는 재능을 품고 있는 청년이다. ‘굳세어라 금순아’시절 연기와 관련한 통곡 일화도 ‘요즘 애들’ 답지 않게 진지함과 치열함을 지닌 이민기를 대변한다. 85년생의 이 젊은 청년은 아주 깊게 연기라는 우물을 파내려가고 있다. title of the article is "Rainbow Shine"...basically Lee Min-ki is gaining so much popularity to have in up at stardom. He's been casted into several projects such as MBC Best Theatre and now NN6: Rainbow Romance. Being casted in Nonstop is a good thing because it had all the top celebrities. Currently right now who starred in NN become popular. how could a guy like him have been paired up with a guy three times. i loved geumsoon and lee minki was so good-looking. Let's keep this thread alive people!! Hey. I was kinda expecting him to come out in banjun drama. Former S.E.S. member Eugene has chosen her next project, the upcoming MBC Daily Drama 진짜 진짜 좋아해 (I Really Really Like You), which will mark her return to the small screen after a year. The star was last seen on MBC's 원더풀 라이프 (Wonderful Life) alongside Kim Jae-Won, and she will play the leading role in the show, which will start airing from April 1st. Written by Bae Yoo-Mi of 12월의 열대야 (Tropical Nights in December) and produced by Kim Jin-Man of 아일랜드 (Ireland), the Drama tells the story of Yeo Bong-Soon, a country girl who starts working as an assistant cook at the Blue House, and has a quirky love story with the President's bodyguard, called Nam Bong-Gi. Sounds like a mix of 대장금 (Dae Jang Geum) and 내 이름은 김삼순 (My Lovely Sam-Soon), but we'll see in the coming weeks how this unfolds. [마이데일리 = 안지선 기자] MBC TV 청춘 시트콤 `레인보우 로망스`에서 대통령 경호실장을 꿈꾸는 경호학과 대학생으로 출연 중인 신인 연기자 이민기가 드라마 속에서 꿈을 이뤘다. 이민기는 오는 4월 1일 첫 방송 예정인 MBC 새 주말드라마 ‘진짜 진짜 좋아해’(가제, 극본 배유미, 연출 김진만)에서 청와대 경호원 `남봉기` 역에 캐스팅 돼 `봉순이` 유진과 함께 청와대로 향하게 된다. 극중 이민기 가 맡은 `남봉기`는 `여봉순` 유진과 못 말리는 앙숙 관계를 이루게 되는 남자 주인공으로, 유진과 한 집에서 동거를 하게 되면서 자신들도 모르는 사이에 운명적인 사랑에 빠져들게 된다. `진짜 진짜 좋아해`는 시골 처녀 `여봉순`이 청와대로 들어가 요리사로 성장하며 벌이는 활약상과 대통령 경호원 `남봉기`와의 발랄한 러브스토리를 다루게 될 드라마로, ` 봉순 이`가 청와대 최고의 요리사로 성장하는 과정이 의녀 장금이 최고의 요리사로 성장해 나가는 내용을 담았던 드라마 `대장금`과 비슷해 주목을 받고 있다. 어리버리한 산골처녀 유진 의 경호원으로 `늘 푸른 소나무`가 되어 주게 될 이민기는 MBC 인기 일일극 ‘굳세어라 금순아’에서 금순이(한혜진)의 철부지 시동생 역으로 `2005 MBC연기대상`에서 신인상을 수상했으며, 6개월만에 부활한 MBC 베스트극장 `태릉선수촌`에서 유도 선수로 출연한 바 있다. 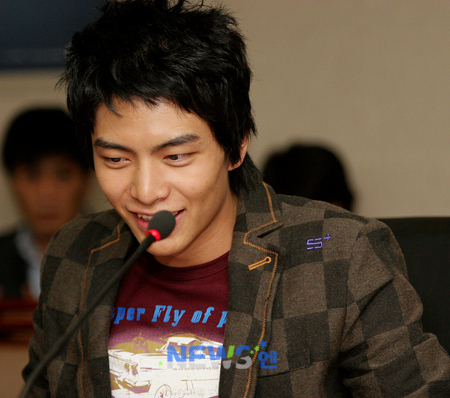 Lee Minki will be coming out in the drama as a bodyguard, named "Nam Bong-Gi" who works in the presidential Blue House. He and Eugene will be roomies, and that's how the 2 will fall in love with each other, since they'll be living together. The relationship of the 2 characters: they start off bickering with each other, and as they live with each other, they start falling in love without knowing. 1/24/06 – Lee Min Gi (이민기) will costar with Eugene in the weekend drama “Really Really Like (진짜 진짜 좋아해)” scheduled to be aired by MBC in April. He plays the role Nam Bong Gi (남봉기) who is a bodyguard working in the Presidential residence Chungwadae (청와대). He is handsome and has humorous and carefree personalities. 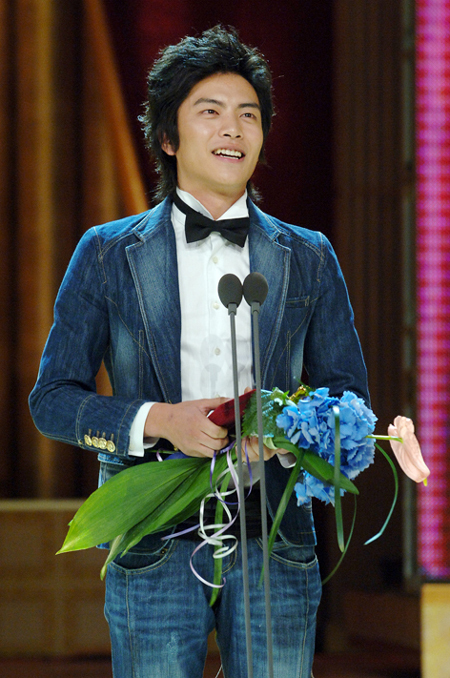 Eugene plays the role Yu Bong Soon (여봉순) working in Chungwadae as a chef. They and the President’s son form triangle love relationship. LMG also acts in MBC youth sitcom “Rainbow Romance (레인보우 로망스)”. ‘금순이 시동생’ 이민기가 일본팬들로부터 뜨거운 애정공세를 받았다. 이민기는 최근 SBS ‘일요일이 좋다’의 코너 ‘X맨을 찾아라’ 촬영을 위해 일본을 방문했다. 미와자키현 수영장에서 진행된 이날 촬영에 300여명의 일본 아줌마팬이 몰려들어 인산인해를 이뤘던 것. 일본 여성팬들은 이민기를 향해 연신 ‘귀엽다’고 환호성을 지르며, ‘자양강장제’와 목욕용품, 일본과자 등을 안겼다. 뜻밖의 애정공세에 당황함을 감추지 못하던 이민기는 일본에서 MBC 드라마 ‘굳세어라 금순아’ ‘태릉선수촌’ ‘레인보우 로망스’ 등을 통해 자신의 얼굴이 알려진 사실을 알게 됐다. 이민기는 “일본에서 내 얼굴이 이렇게 알려져 있을 것이라고는 생각지도 못했다”며 “특히 내 사진을 확대해 부채로 만들어온 한 여성팬이 기억에 남는다”고 기쁨을 전했다. 한편, 이민기는 현재 MBC '레인보우 로망스'에서 경호학과 학생으로 출연해 배꼽잡는 좌충우돌 연기를 펼치고 있다. Basically the article says that LMK recieved some kind of Soy Sauce as a gift from his Japanese fans in Japan. He went to Japan to film 'X-Man Japan Special' episode...and there, about 300 Japanese fans came to see him and gave him Soy Sauce as a gift...and stuff like that. LMK was surprised/shocked...finding out that his Japanese fans know him from all his previous and current dramas/shows he was in. He wouldn't have thought that he was pretty famous in Japan. So that made him happy. it will b interesting to see him have his first lead role in the drama w/ eugene. he's so adorable in RR ;__;... and wuw, he's good actor *_*!!!... Good Luck to Minki!! !